Line 2 baking sheets with parchment paper. In a medium size bowl, whisk the flour with the sugar and salt. Add the egg white and whisk until smooth. Whisk in the butter until smooth and creamy. Spoon teaspoons of the batter 3 inches apart on the prepared baking sheets and spread to 2-inch rounds. Sprinkle with the ground tea leaves and bake in the upper and middle third of the oven for about 15 minutes, shifting the pans from top to bottom and front to back, until the tuiles are golden and fragrant. Leave to cool. Soak mushrooms in Oolong tea overnight. Strain and chop into thin slices. Sauté chopped shallots in oil until soft and translucent. Add in mushroom slices and fry till softened. Blend in a food processor with the crème fraiche. 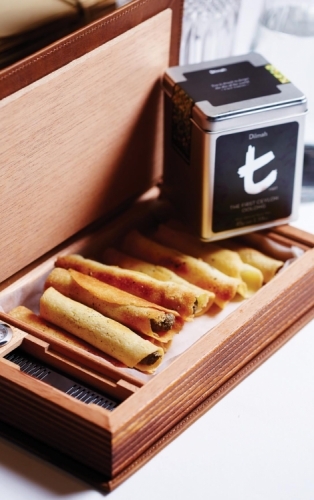 Pipe into cigar tuiles and serve.